Age. 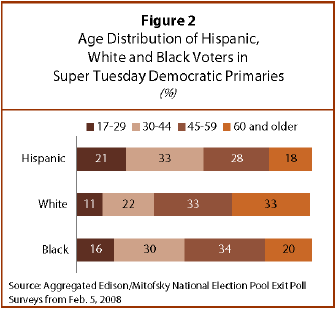 Hispanic voters on Super Tuesday were much younger than white or black voters.4 The relative youth of the Hispanic vote is largely a reflection of the relative youth of the Hispanic population overall.5 More than one-in-five Hispanic voters on Super Tuesday were ages 17 to 29, and more than half were under 45 years of age. Fewer than one-in-five Hispanic voters were ages 60 and older. Hispanic voters are youthful particularly when compared with non-Hispanic white voters. Only one-in-ten white voters was ages 17 to 29 and one-in-three whites was ages 60 and older. Education. 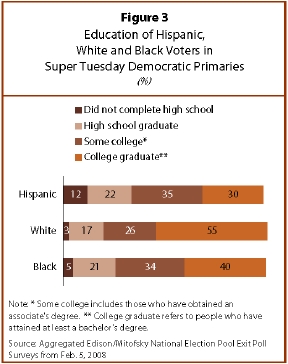 Hispanic voters on Super Tuesday were less likely to have attended college or have a college degree than white or black voters. Of Hispanics, 65% have more than a high school education, compared with 81% of whites and 74% of blacks. By contrast, 12% of Hispanics had not finished high school, compared with 3% of white voters in the Super Tuesday Democratic primaries and 5% of black voters. Income. 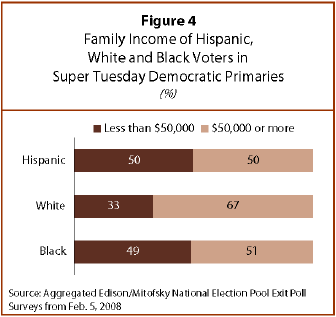 Half of all Latinos who voted in the Super Tuesday Democratic primaries had a family income of $50,000 or more, similar to the share of black voters. Two-thirds of white voters had that level of family income. Church Attendance. 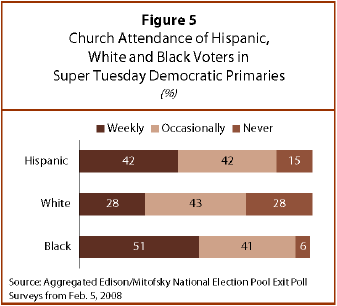 Regular churchgoers form a sizable share of the Latino Democratic electorate. More than four-in-ten Latino voters in the Democratic primaries attend church at least weekly, while just 15% said they never attend church. Latino voters were more likely than white voters to be regular churchgoers, but less likely than black voters to go to church weekly.